Clear Vinyl Intermittent Self Catheters: Suitable for male or female catheterization. Smooth tip, comfort eyes and funnel end. Radiopaque. Male/Universal Clear Vinyl Intermittent Self Catheter. They come in different lengths and if not stock can be special ordered. Silicone-Elastomer-Coated Foley Catheter: An innovative manufacturing process provides the maximum amount of silicone coating available. Latex catheter coated internally and externally in 100% silicone to resist encrustation and bacterial colonization. 2-way Foley. Sterile. 2-way, Foley, 5cc balloon, 16Fr. Rubber Latex Urethral Catheters: Suitable for male or female catheterization. Smooth tip, two oval eyes and funnel end. 16″ length and radiopaque. 14Fr. 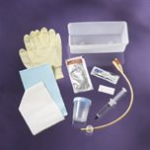 Foley Insertion Tray Kit: Each kit has all the materials required to insert a Foley catheter. Choose your own drain bag and catheter size to meet the needs of specific patients. Each kit has a graduated collection basin and moisture-proof underpad and contains the following:-Graduated Collection Basin-Lubricating Jelly Packet-Inflation Syringe-Underpad-Wrapped Gloves-Fenestrated Drape-Aloetouch® 3G Gloves – Latex Free Also Contains CSR Wrapped Tray 10cc syringe, 3-pk PVP , and specimen container with ID label. Leg Bags W/ Comfort Strap and Twist Valve Drainage Port: These sturdy bags are latex-free and have a sterile fluid pathway. Medium (19 oz./600ml). Drain Bags: Drain bags come with a reinforced hanger with built-in anti-kink drain tube guide. 50″ of 11/32″ STAR tubing facilitates drainage of thick, fibrous urine while resisting kinking. Adjustable bed sheet clamp secures tubing and needleless sample port that is accessible with either a blunt cannula or needle.2000mL capacity, 20 each case. Continuous Bladder Irrigation Drain bag. 4000mL capacity, Anti-Reflux Tower, drainage port with metal clamp. Packaged O.R. sterile in Tyvek peel pouch.